The time has come to claim your prize from the Free Captains' Regatta: the supposedly uninhabited Island of Empty Eyes. The ruins prove to be a bit more inhabited - and dangerous - than they might have first appeared. 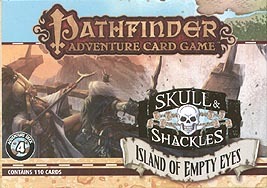 In the Pathfinder Adventure Card Game: Island of Empty Eyes Adventure Deck, you must tame the island, throw a rollicking feast, and gain seats on the Pirate Council. This 110-card expansion includes new rare loot cards and 5 new scenarios that make up the complete Island of Empty Eyes adventure, along with new monsters, locations, villains, and more. Continue your character's legend with the Pathfinder Adventure Card Game: Island of Empty Eyes Adventure Deck. This deck requires the Pathfinder Adventure Card Game. Skull & Shackles Base Set, The Wormwood Mutiny Adventure Deck, the Raiders of the Fever Sea Adventure Deck, and the Tempest Rising Adventure Deck.